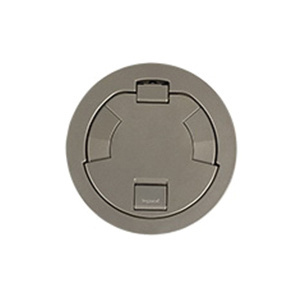 Wiremold Recessed device cover in nickel finish, has aluminum construction for durability. The round cover measuring 7-1/4-Inch Dia x 1-5/32-Inch, supports screw-on mounting. It is suitable for use with 6STC, 6STCP and 6STCPAV poke-thru stem assemblies. Recessed device cover is RoHS compliant.